Canto di Donna, Canto di telaio, Valeria Scuteri, by Silvana Nota, catalogue of the exhibition at Chieri, Palazzo Opesso, 11 september until 10 October 2004, 48 pages, color and black and white pictures, Euro 7.-. Valeria Scuteri was born ar Stignano, near Reggio Calabria, in 1953. She came to Turin, got the leaving certificate at the local Art High School. amd them attendedhje Accademia Albertina (Academy of Fine Arts) under the guidance of professors Piero Martina and Filippo Scropopo. A paintress and a sculptress, she improved her education at the atelier of the Piedmontese master Teonesto Deabate, a fundamental figure along all her professional and human progress, to whom she had been linked by a close, both artistic and philosophic bond, beyond any stylistic or discipleship influence. Such bond was borken off just by the paonter's death, in 1981. 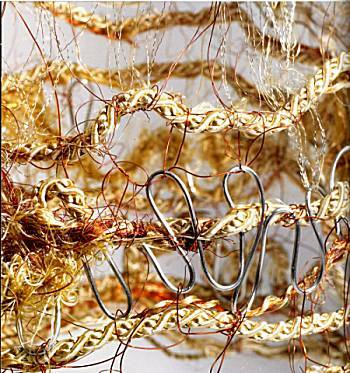 Woven sculptures, installations, wearable art, objet-dresses have been realized by means of both traditional and experimental techniques, ranging from hand-loom to free loom (just the frame of a great painting, where canvas was taken away) to get to off loom and then to manipulations, crocheting, knitting, macramé, webbing and assembling. Among other prizes for her career, in 1979 in Moncalieri she was awarded the Premio Saturno per l'Arte e la Cultura and, on 8th March 1979 she represented Italian women in a documentary about artists/women and mothers, called "Das Ende der Mama", directed by Gudrun Friedrien and broadcast on a German TV channel. 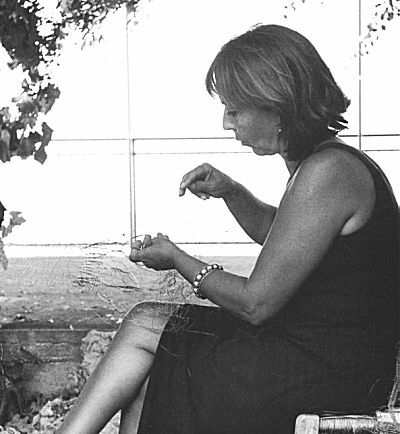 In 2004 a work of hers was accepted at the 4th Internatrional Fiber Art Biennial Exhibition called Trame d'Autore, organized by the Municipality of Chieri. She lives and works in Moncalieri (Turin).